I’m excited to announce that in the last month, I have advanced two levels in my kung fu training. In November, my Ngo Cho Kun kung fu group held an advancement ceremony for the students. I have now been in kung fu for about seven months. During that time, I was merely a student with no level. Now, I am a Tiger. I still need to catch up to my three siblings. I have a long way to go, but I’m sure with my continued hard work, I will be on even grounds with them. The advancement ceremony was hard for me. If you follow my blog, then you know that in my last post I wrote about how I become very anxious and uncertain when I perform in front of an audience. This is my personal battle; a struggle that affects my mind and movement whenever I stand before a crowd. Despite facing my greatest weakness, I think that I did a relatively okay job. It was good enough that I moved up two levels. I felt a rush of panic almost the instant when I walked into the room. I was one of the first ones to enter the martial arts studio. The mat laid out was a contrast of bright blue and red. The lights hanging from the ceiling seemed to bounce right off them and reflected into my eyes. It was dizzying. I went through a few drills with my sister before we began, but as the rest of the group arrived, the one’s being tested were separate by the one’s who were judging. I have three actual blood-related siblings in kung fu who have already received their black belts. All three of them have been training for number of years already, so that makes me feel better. But the fact that two of those siblings are younger than me, made my heart beat a little harder than necessary. While others may not think that this ceremony is really that big of a deal, for me it was important. Not because I necessarily feel that I have to prove something, but because I want to show the others in my group that I take kung fu seriously. How the ceremony works is that all of the students who have achieved the black belt level are summoned to watch their juniors perform what they have learned. The black belt students judge the performances and give each of the junior students a rating. Based on the results, the student may advance to the next level. Under their careful eyes, me and my fellow junior practitioners moved forward in kung fu. As you might know, each kung fu school – or martial arts school – has it’s own criteria for levelling. For my style, the Kong Han Canada Ngo Cho Kun, the students can advance up to four levels. I jumped up two consecutive levels at the latest ceremony. The first level for our style of martial arts is Eagle. To advance to this level, students must know 3-4 materials from this style. This could be either any combination of empty hand forms, weapon styles, or set drills. The motto for the Eagle level is “indomitable”, meaning unbeatable or invincible confidence. The second level is represented by a Tiger. This level requires that a student is able to demonstrate 5-6 of the set materials. In addition to knowing empty hand forms, weapon styles, and set drills, the student has to be able to perform the basics of lei tai sparring. The motto for the Tiger level is “Brave no Fear”. This means that the students have to have the ability, courage, and will to hold their ground and defend themselves and their space. The third level represents the mascot of Ngo Cho Kun, a Lion. As the third step in the journey, students need to show that they know and are competent in performing 7-8 of the materials. They may learn more weapon or hand forms, drills on top of what they learned and are able to demonstrate from the Eagle and Tiger levels. The motto of the Lion level is “The Rock”. This stands for having a sturdy and strong structure like a fort. As in many martial arts, the final level of advancement is represented by a black belt and is where a student can show true proficiency in the kung fu style. The O Duan has a number of levels within this section that go from 1-10. The O Duan is a record of a student’s kung fu journey. 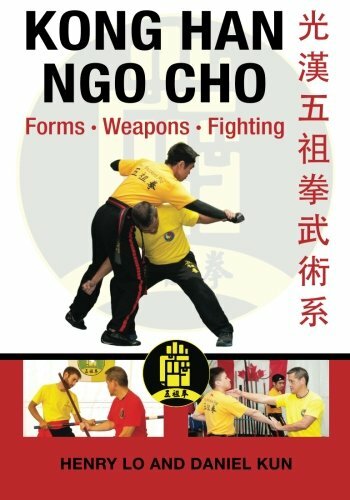 Aside from the number of NGO Cho Kun hand and weapon forms and techniques a student has to learn, it is also a testament of the contribution, skills, knowledge, and maturity in absorbing not just the Ngo Cho Kun kung fu style, but also the spiritual practice and enlightement. Previous: Previous post: Is Stage Fright Your Cryptonite?